Read personal stories that the awareness campaign used to show why people need support from benefits. The Who Benefits? campaign ran from 2013 to 2015, giving a voice to the millions of us who have been supported by benefits at some point in our lives. 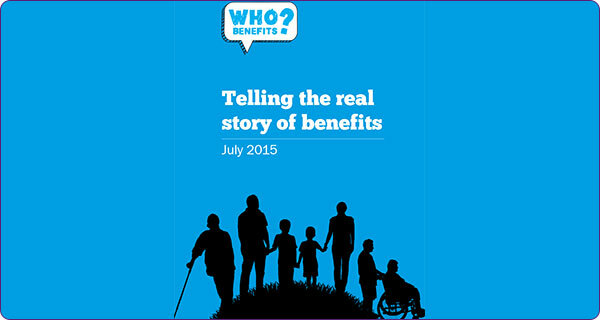 Read the final report 'Telling the real story of benefits' which includes personal accounts from many people claiming benefits. A coalition of over 100 charities, faith organisations, professional networks and community groups, the campaign reached a huge range of people who have needed help from benefits for a whole variety of different reasons, sharing their stories and in doing so, helping to change debate. The campaign challenged the negative portrayal of benefits claimants in mainstream media. It shone a light on stigma in the 'Second Class Citizens' report and sought to convince politicians that they should do more to listen to, understand and act on the real reasons that people are struggling — like low wages, the high cost of living and the housing crisis. Above all, the campaign championed voices – using personal stories to show why people need support from benefits and how crucial this help can be. Use our Benefits Calculator to check your entitlement to benefits and our Grants Search to see if you are eligible for help from a charitable fund, based on your personal background, circumstances and needs.